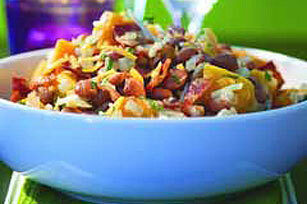 Pinto beans, chopped bacon and tender cubes of butternut squash give this tasty side dish its hearty appeal. Cook bacon and onions in large nonstick skillet on medium-high heat 10 min. or until bacon is crisp, stirring frequently. Add squash and broth. Bring to boil. Reduce heat to medium-low; simmer 10 min. or until squash is tender. Add beans; stir. Cover. Cook 8 to 10 min. or until heated through. Enjoy your favorite foods, but keep portion size in mind. A serving of this savory squash is 1/2 cup. This large cylindrical winter squash looks rather like a giant pear in shape. The color ranges from pale yellow to light beige. The flesh is bright orange and sweet. It can be baked, steamed or simmered. Cut the squash in half. Scoop out the seeds with a spoon. Use a vegetable peeler to remove the outer skin and then cut into cubes for use in skillets, stews or soups. Half of a small squash will yield about 2 cups cubed squash.